Leslie (left) and Rick Kalama show Hawaiian hand signs in front of their new eatery, Kalama’s Island Style Restaurant, which occupies the former location of Malena’s Café in Ephraim. EPHRAIM—Hawaiian flavor has come to Ephraim. A new restaurant is opening its doors and planning a grand opening on March 4 at the former location of Malena’s Café, at 61 S. Main in Ephraim. The owners, Leslie and Rick Kalama, recently moved to Sanpete from Maui island in Hawaii. 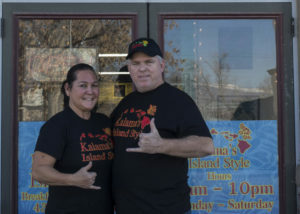 The couple says “aloha” to their new community, and welcome them to their eatery, Kalama’s Island Style Restaurant, which specializes in Hawaiian food. 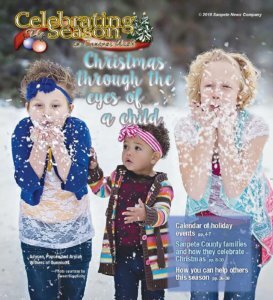 The couple, who have a combined 40 years of restaurant experience, say they have had a dream to open a restaurant in Sanpete. They will plan to offer a menu that includes items such as Kalbi short ribs, Panko-crusted Furikake fish, Yakisoba noodles, Kalua pork, island-style salads, rice bowls and volcano fries. Diet plates are available. The grand opening on March 4 will begin with a traditional Hawaiian program, the couple say. The program will continue at 6:30 p.m. with live music and dance. The new island eatery is open Monday through Saturday, 8 a.m. to 10 p.m., and their phone is 283-3577.